A+ Writing Improvement Program - Get Higher Scores! Covers creative & persuasive writing. Perfect for NAPLAN & Selective School Tests and Scholarship Entrance Exams Preparation. It's Incredible! - Here's Proof that Writing Club Works! Losing Marks in the Writing Test? Well... Writing Improvement is hard! In July 2017, desperate parents sent me an email that cried out "But his writing skill is very poor. He had been to few English tutoring but no improvement at all". These parents were stressed out because they had continually seen their child struggling in what is considered one of the most important subjects around. Without the ability to help their child themselves (as their English wasn't good), they felt hopeless. And moreover, the hard-earned money they spent to help their child through tutoring, wasn't providing any results. Unfortunately, this is not a once-off incident. I get emails like this from parents all the time. It highlights a big problem with your standard tuition. If your child has strong writing skills, your child will be held back going over things they already know. If your child needs help, in large group classes, they won't get the attention they deserve. In both instances, you waste your money and your child wastes their time. After all, in large group classes by other tuition providers, your child is just one of many. Writing club focuses solely on writing practice and feedback. Real improvement doesn't come from generic classes with no valuable feedback—real writing improvement comes from Writing Club where your child gets regular practice and feedback. Stop losing marks and start gaining them with Writing Club—a program of regular writing practice and feedback. See available writing clubs to join & start seeing real writing improvement. How does writing club work? There are different plans to suit your needs and study level. Each plan subscription goes for 31 days and you can choose to extend your subscription once it expires. We'll ask you for your exam details & allocate your first writing prompt. Complete this & request your score & feedback. After you get your score and feedback, go through any masterclass videos suggested (selected plans) and then practice on your next writing prompts incorporating the feedback & see your grade improve. Expert Writing Insights - Our unique writing feedback software gives your writing a ranking along with feedback on weak areas and tips on how to improve it. It's this feedback that's invaluable when you want to know where exactly your writing falls short, what to improve on and how. See an example here. Start your writing improvement - Find a writing club plan now! Proof that Writing Club Works! Writing club is a program that works to improve your weak points by specifically assessing your writing in detail through expert writing insights and making masterclass video recommendations that are useful. Through a cycle of continued practice, your writing will improve. Writing club is the smart way to improve writing! Our past writing club students have improved and here's proof, so why hold yourself back? 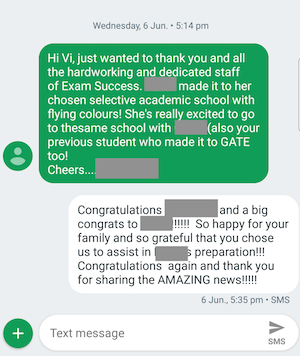 See the results - below shows real writing by a writing club student who went from average writing with lots of telling to writing a piece that related to the prompt and had better expression... in just 5 weeks! Your child can access writing club anywhere where there’s a computer with Internet access. Access to writing club is through one low price month-to-month and there are no lock-in contracts. Gone are the days of vague feedback like “good work” or “needs improvement”. You need more than that! Through our in-house developed software - Expert Writing Insights, you will get your writing piece ranked and explained via a written report. You'll also be given valuable insights over a number of criteria that explains why you got the mark you got, what your 5 key weaknesses are and tips to improve your writing based on these identified weaknesses. You can check out an example of Expert Writing Insights here. Students hardly get a chance to do regular writing practice at school yet regular practice is so important! Your child is encouraged to practice writing full writing pieces with count down timers through our in-house writing software. 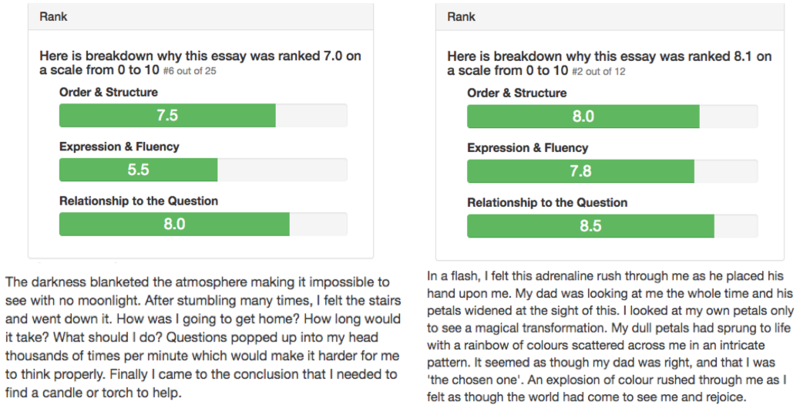 Our feedback goes over your submitted writing piece and points out areas you need to fix up to gain that higher score. It’s hard to improve when you don’t know exactly what the problem with your child’s writing is. And with writing, there are so many ways your child could lose marks. With our own developed Expert Writing Insights, we have pinpointed 52 ways you could lose makes so you'll know exactly where you need to improve. More importantly, you'll be told what you need to do to improve it with masterclass videos (selected plans) and Expert Writing Insights guidance. Do you want better NAPLAN, selective school or scholarship scores for written expression? Or just want to improve writing? Find a Writing Club Plan That’s Right for You. Only pay month-to-month. No lock-in contracts. What are the terms and conditions of writing club? You can find our general terms and conditions on the website and specifically, additional terms and conditions relating to reading and writing clubs can be found in the FAQs sections and here. How does it work after I order? After your order, you'll be sent an email with your log in details and instructions on how to get started. Can this be only done for exams or can it be done for general improvement? Writing Club can be done for general improvement aswell as exams. In fact, Writing Club can help you maintain and build up your writing skills over time. Remember writing is a creative skill and it takes time to build up this skill. Think about tennis, in order to improve, you keep practicing. It's the same with writing. When should I start writing club compared to the date of my exam? This really depends on your writing level. If you're getting Cs, I'd start at least a year before and if you're getting As then probably 2-3 months prior would be good. Remember, that Writing club is ongoing and writing improves with time so the earlier the better - you can also do it as regular program and extend each time. Writing Club is accessed through a monthly payment. You pay for each month of access. Does my access to videos, practice sessions and writing feedback carry through if I don’t use them in that month? No. Access is per month and by subscription. There are no carry overs. Are there refunds if you don’t use your access? Your subscription pays for access, not usage. After the end of the month, your access stops and if you wish to renew, you just click on the extend access button and you can upgrade or downgrade your plan. Your subscription fees for the current month are generally non-refundable, subject to law. What if I don’t need writing club for a specific month because I’m going on holidays? Can I pause it? Of course! At the moment, writing club is paused after the month of your subscription. If you're on holidays, just don't click extend access for that month. What happens to my access if I pause or cancel? If your plan is inactive (not extended), you will not be able to access any videos, practice sessions or writing ranking and feedback during the pause period. If you close your account, your learning plan will no longer be available. How many masterclass videos are there to choose from and how long is each masterclass video? There are 96 masterclass videos that you can choose from and each video is at least 30 minutes in duration. There will be 46 masterclass videos covering argumentative/persuasive writing, 46 masterclass videos cover creative writing and 1 masterclass video each on time strategy and major tips for each of NAPLAN Year 3 & 5, NAPLAN Year 7 & 9, Selective schools tests and scholarship test. What happens with writing ranking and feedback? Is it anonymous? Writing pieces, ranking and insights through Expert Writing Insights is publicly available, however, when you sign up, we allocate an anonymous username to your account so that you’re not publicly identified. You can change this name to anything you like that is appropriate.